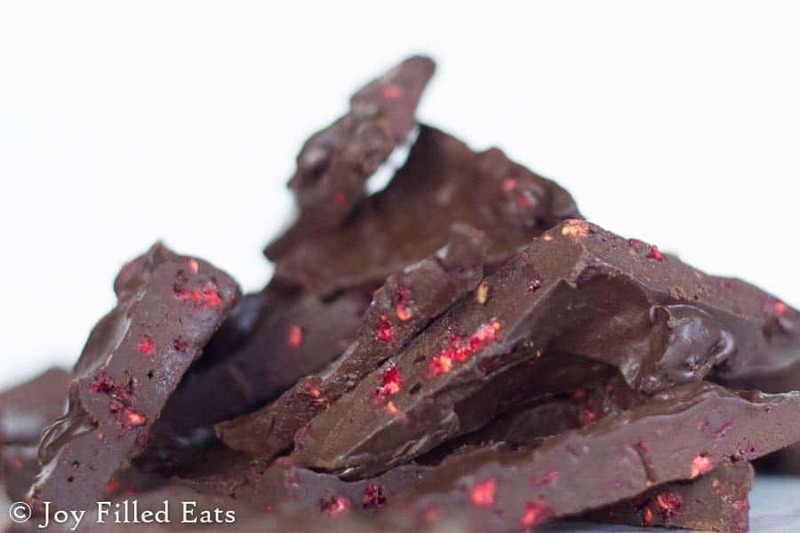 Dark chocolate raspberry is such a great flavor combination. I’ve used it before and I’ll totally use it again. Last night I decided to make a quick dessert and I loved the results. 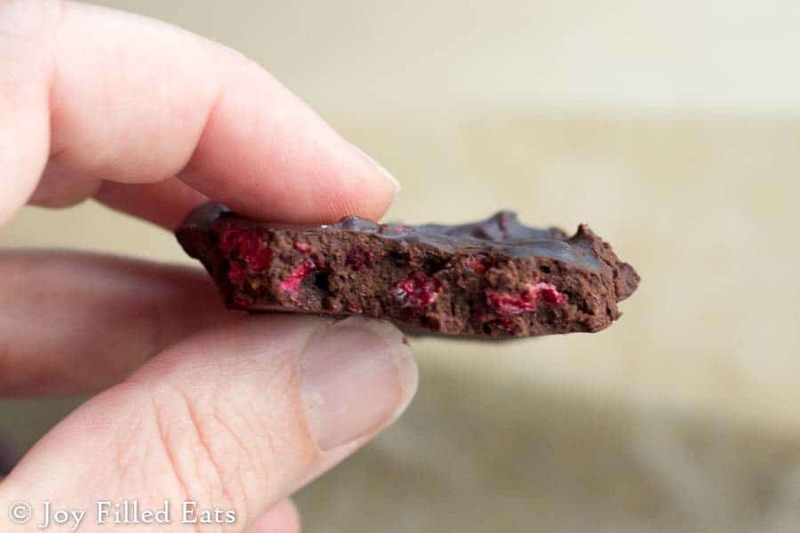 This tastes like a chocolate raspberry truffle without all the trouble of rolling the chocolate mixture into balls and ending up up to your elbows in chocolate. This has only four ingredients, is dairy/sugar/grain/gluten free, low carb, and THM S.
I love truffles but rolling them can be so messy. This is an easy way to have the consistency and taste of a truffle but the ease of a bark. See the missing corner from this photo? That was my breakfast. No guilt. A little while later I saw the toddler coming out of the fridge covered in chocolate. 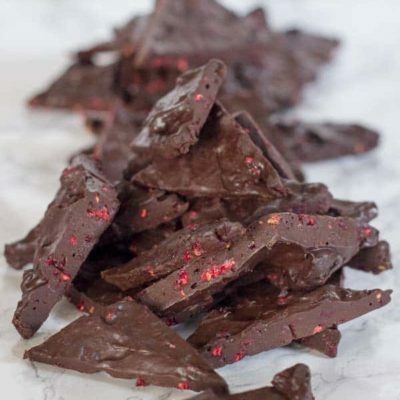 I guess I should’ve put my truffle bark tray on a higher shelf… chocolate might be ok for mommy to eat for breakfast but I prefer my children eat real breakfast food like eggs and bacon. I want to try this as a ganache topping on cake next. Isn’t that chocolate swirl beautiful? 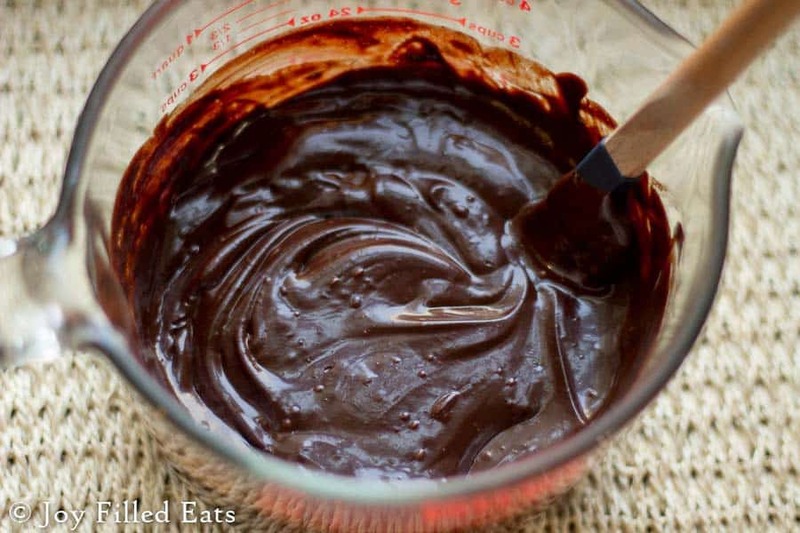 In a microwavable bowl or on top of a double boiler melt the chocolate. I melt it in the microwave stirring every thirty seconds. When it is melted stir in the coconut cream and sweetener. Open the bag of freeze dried raspberries to let out the air then put the bag on the counter and lightly squish it to break up any big pieces. 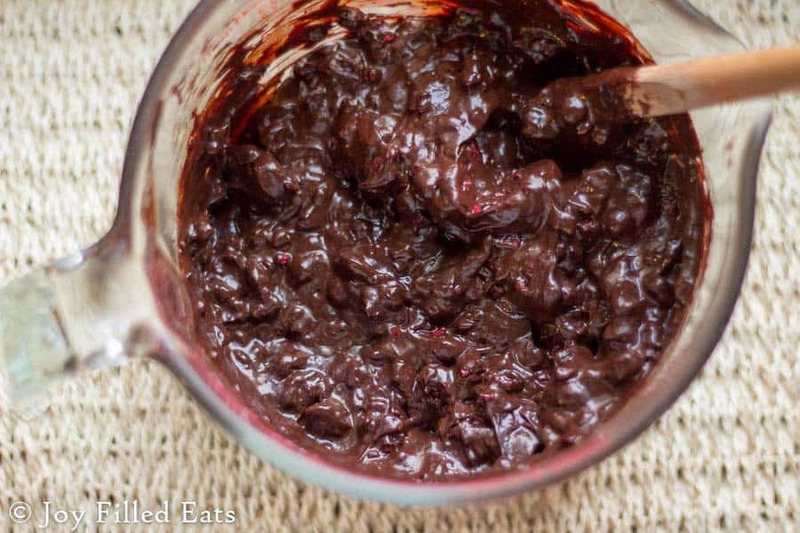 Stir the raspberries into the chocolate. Taste it. If it is not sweet enough you can add more sweetener. I like dark and semi sweet chocolate but this might not be sweet enough for everyone. 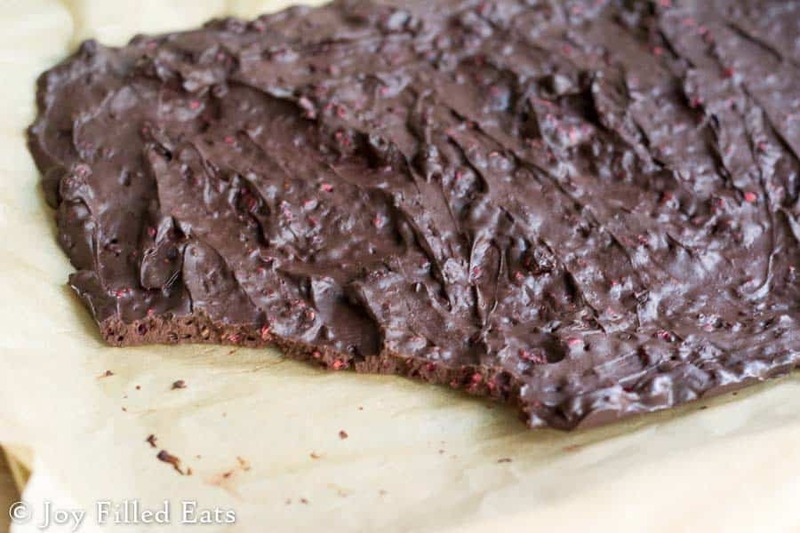 Spread on a parchment or wax paper lined baking sheet and refrigerate until firm. This will end up the consistency of a truffle, slightly soft but still firm. I cut it into triangles with a pizza cutter. Store in the refrigerator. 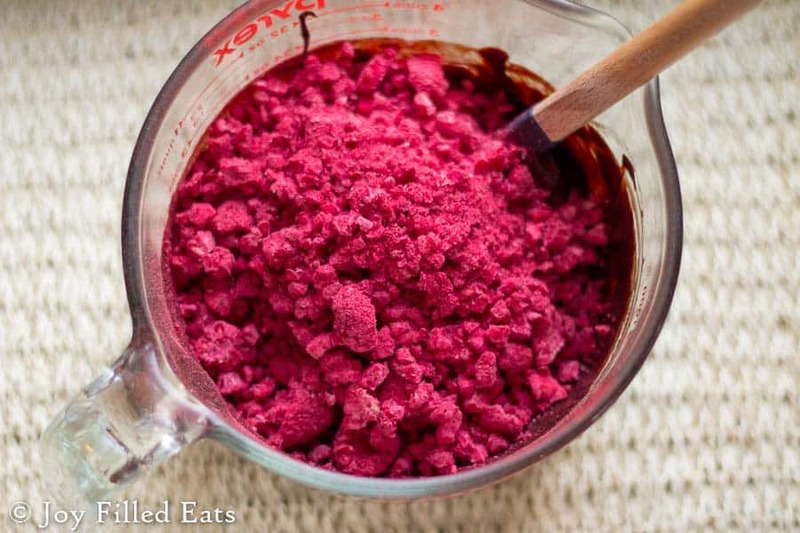 Can I use frozen raspberries? No, sorry, they are too wet. The will separate from the chocolate. You need freeze dried for this. Any freeze-dried berries will work. Strawberries can be a little easier to find than raspberries. Hello, what's the complete nutrition information for this recipe please. Thanks! I just added the nutrition facts to the bottom of the post. Thanks! mine did not hardened at all. What did i do wrong? I used lilly chocolate chips for the chocolate and freeze dried raspberries and one can of coconut cream as indicated in instructions. Hi Rita, did you use 7 oz of chocolate with the 5 oz can of coconut cream? Since I added sweetener to 7 oz of chocolate it would've made it about 8 oz. I'm not sure why yours didn't harden. Oh em gee, these look amazing! 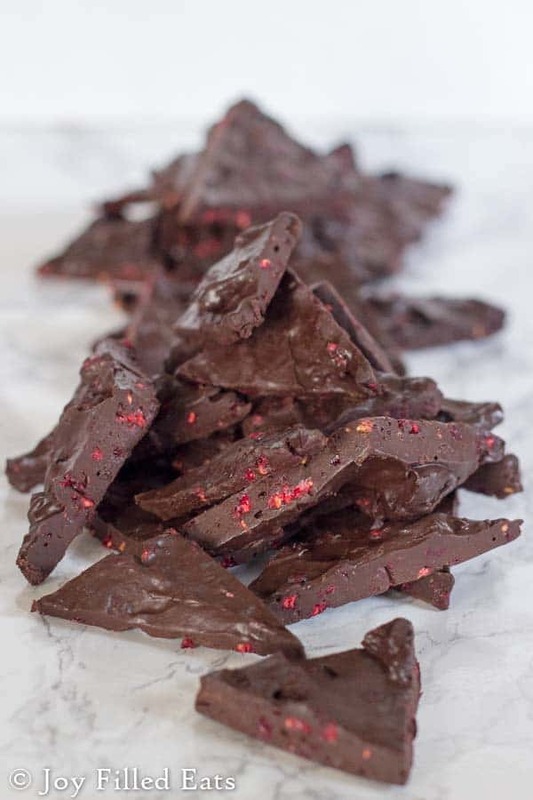 I *love* simple little candyish desserts like this, perfect for a sweet bite with my evening tea - this is better ingredients than the cream cheese "fudge" I often make, and much prettier too ;) I may or may not be running out for freeze dried fruit this afternoon! This is so delicious!! I had to move mine to the freezer to harden because it was still too soft in the fridge. Thanks for the recipe! I haven't come across freeze dried raspberries. What kind of carbs does it have? 1 bag had 29 carbs and 11 grams of fiber. So 18 net carbs divided by twelve servings of this recipe only adds 1.5 carbs per serving. I've purchased them online, at Target, and at Trader Joe's. Is canned coconut milk (full fat) the same thing as coconut cream? thanks...this looks soooo good!!! I couldn't taste the coconut at all.